Local Content, Locally Owned, Locally Produced. I was a working artist once. Wait, let me explain. For about 5 years I worked in the media. 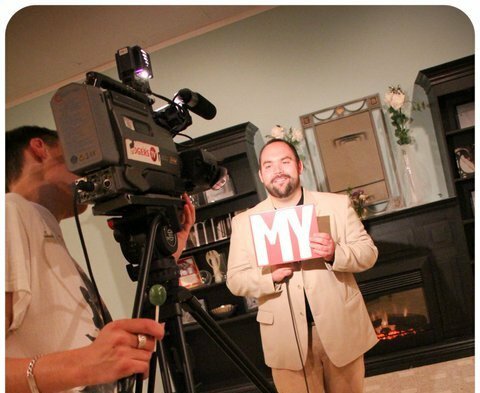 I was the Executive Producer of a small video and television production company in Ottawa during my early 20’s. The organization was called TV Zoom. We had about 8 staffers, all of us quite young and, in my time there, we probably trained over 150 students on the technical aspects of shooting, editing, writing, and other elements of TV production. Some of the work was glamourous, like fashion shows and wrestling pay-per-views. Other gigs had a lot less glamour to them. For example, I made infomercials that were seen across the continent for a product line that will remain nameless, but here’s a hint: you probably own one, have it in your kitchen, and make smoothies with it. I actually got started in high school learning from Mike Olech, who taught me for 4 years as the head of the Communications Department at Assumption College School, and Jason Souliere, my co-op supervisor at Rogers Television in Brantford. Small local opportunities to gain experience in the field led to something that paid for a good chunk of my education. I still edit video today. I volunteer my skills for causes I feel deserve more attention. I also have a YouTube account, and use it to highlight social and community issues I think are important. For other working artists humble beginnings have become lasting careers. Brett Kelly and I worked together at TV Zoom. He was the Programming Director and Station Manager there. He’s now the Owner/Director of Brett Kelly Entertainment which is a feature film production company that’s made everything from cult films to pirate films to westerns and even a children’s movie. 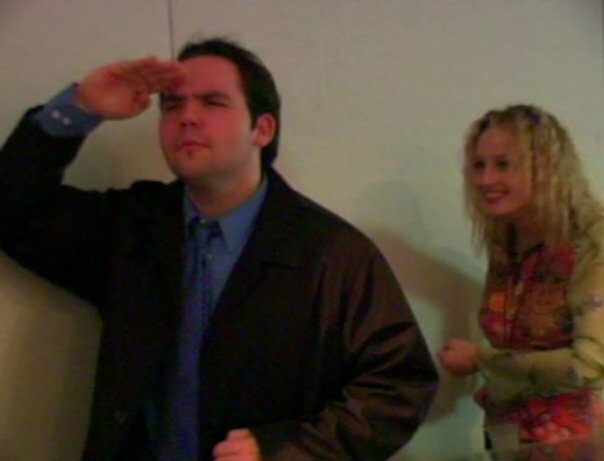 Brett’s now made over 20 films. I remember having long conversations with him about his love of Lloyd Kaufman’s Troma Films. He even got to interview Lloyd during his time at TV Zoom. Now Brett is one of Lloyd’s contemporaries and has branched off in many exciting directions. My friend and former co-worker Lee-Ann Cass now works as an Editor or an Assistant Editor depending on the project. Her first paid media work was at TV Zoom. I remember she thought there was no way we were going to hire her. In truth, we probably didn’t need to because she would have done all that work for free. But any managers know that those are the best people to get on your team. The passion they bring to their work is incredible and infectious. I’ve really enjoyed catching the shows she’s worked on over the years on channels like Much Music, CTV, Global Television, Showcase and The CW. I have very fond recollections of taking Natalie Kalata, who volunteered for us, to places like the Museum of Civilization to make profiles on the exhibitions there. She was always professional and had some amazing natural insights on what an audience would find interesting. I shot her first ever interview with then-Burnaby B.C. MP Svend Robinson. Natalie is now a video-journalist at CBC Toronto who shoots, writes and presents the news for television, radio and the web. She’s worked in Saskatchewan, Newfoundland and Labrador and has covered everything from weather catastrophes to hostage situations. Her work has been showcased on The National, and her stories have earned her a Gemini, multiple Edward R. Murrow awards and other accolades too numerous to list here. These are just a few examples (of many) from one itsy-bitsy production house that ran on a shoestring budget. I have other friends who are working artists or who just as importantly work in some other facet of the arts and culture sector. Some work for MTV Canada, others make their living as painters, cartoonists, costume designers, curators, festival organizers, editors, comedians, actors, dancers and graphic designers. I have a few friends who make a decent living as recording artists of some acclaim, others who write and some who are professional photographers and photojournalists. Many of them happily live in Brantford, Brant County and Six Nations and more are coming. Thirty-six per cent of working artists live outside of major urban areas, and that number is growing as the big cities become too expensive. The internet makes it easier to connect with a wide array of clients and partners. They’re coming to places like Brantford and, if we make a few good strategic decisions, more will come and more will grow from our community. Brantford and our surrounding areas, if we are smart about it, will entice them here as we would any industry that can diversify and grow our economy. 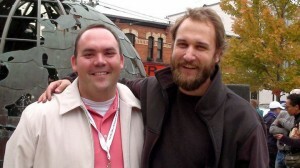 Marc with Juno Nominee Craig Cardiff who will be playing at The Station Coffee House on March 21st, 2012. Stats Canada reported in 2007 that the economic contribution of the arts and culture sector in Canada was $43.2 billion, that those employed in arts and culture sector represented nearly 4% of national employment (over 600,000 people) and accounted for 7.4% of Canada’s Gross Domestic Product. There are more arguments to be made in support of the arts beyond the benefits of the creative economy. It’s said that during World War II when he was pushed by fellow politicians to shut down the theatres and museums in order to save money, then-British Prime Minister Winston Churchill’s response was: “What are we fighting for then?” The side benefits like promoting an engaged citizenry, improving our sense of community and quality of life can be transformational. All of those benefits are nice but we don’t need just the sentimental arguments when all the financial ones make sense too. Copyright © 2019 The Brant Advocate. All Rights Reserved.